O what wings dare he aspire? The inspiring words of William Blake’s “The Tiger” captures the essence of the drama Daebak. his two tiger cubs: one recognized, Yeoning; and one not, Dae Gil. Where will this drama take the two brothers now emerging as tigers themselves searching for their individual thrones and destiny? The suspicion rises in Episode 22, and the hunt begins anew. The body found with Dae Gil’s arrow is not that of Yi In Jwa. He cowers in the bushes in fear. DaeGil senses him and approaches with his sword drawn but is distracted by the announcement that the King is dead and they must return to the palace. Dae Gil shouts out to Yi In Jwa, “Live hiding like that forever, like a rat without showing your ugly face.” After everyone departs, Yi In Jwa laughs, knowing he’s escaped yet again. The King knows the food prepared by the Prince is possibly poisonous (raw crab with soy sauce and persimmons), but chooses to eat it anyway since his life was reaching a close. 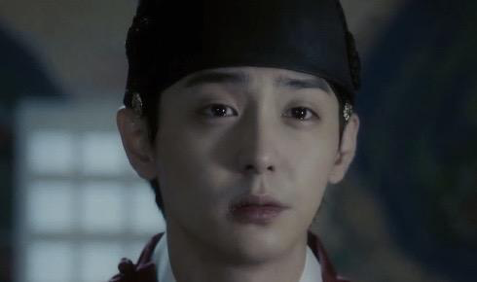 King Gyeongjong says, “I am sorry,” to his half-brother, the Crown Prince. The distraught Queen rushes to her husband. She will soon become a fierce enemy of the new King. The brotherly bonds are severed by doubt. 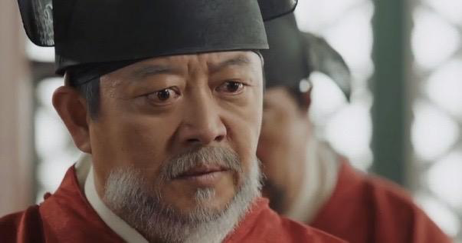 When Dae Gil arrives at the palace, he thinks to himself, “Crown Prince, it wasn’t you, was it?” He rushes to see Yeoning in time to see the Soron ministers accuse Yeoning of poisoning the king. He asks Yeoning to confirm that he had nothing to do with his brother’s death. Dae Gil replies, “I trust you, Crown Prince.” But there was a moment of suspicion in his heart. “You’ve already thrown me away. I am not the Crown Prince; I am the King!” Yeoning retorts and leaves. It is time for the two Tigers to separate and find their own destinies. family is complete for their journey to a good and safe place. Sometime later, a note arrives for the Shaman which tells her “Wait for me.” Yi In Jwa, the cat with nine lives, is on the hunt and will return. The new king’s reign begins in all its majesty and glorious attention to detail. 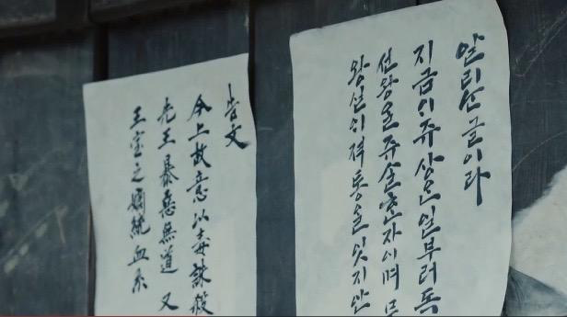 We are given a sense of the Joseon Era’s majesty with the beautiful cinematography and set design. As Yeongjo and Dae Gill look at each other across the crowded palace grounds, they silently say goodbye. Outside, Man Geum passes a dirty, bedraggled Yi In Jwa and thinks, no, that man can’t be him. The new King Yeongjo commences his reign with retribution: the punishment of those Soron ministers who were behind the slaughter of Yeongjo’s Noron supporters. 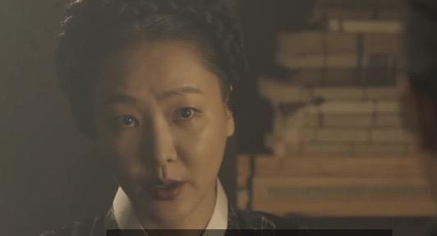 Kim II Kyung and Mok Ho Ryung are to be executed. Some years later, the Revolution begins with the posting of signs casting aspersion on the current king’s ancestry and right to the throne as well as saying he poisoned the former king. Yi In Jwa collects his rebel supporters from their hiding places. He tells them that as soon as he takes control of Cheongju Fortress (15 March 1728), they are to take the Yeongnam region and Jeonju in the Honam region. 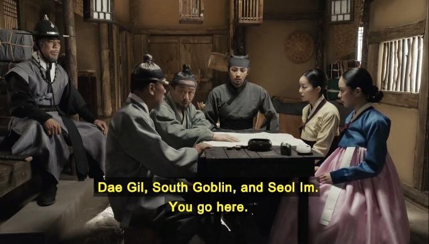 Meanwhile, Dae Gil, who lives happily in a small village with his family, learns of the rebellion and says they should prepare just in case it’s necessary. 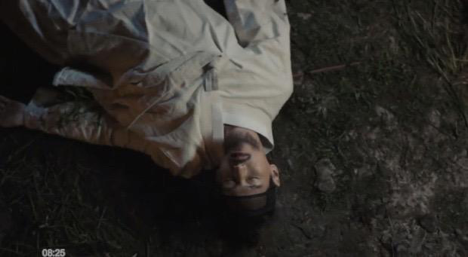 At that moment, Kim Chae Gun arrives and reports that the King’s forces slaughtered the entire town of Cheongju because of their possible loyalty to Yi In Jwa. The King summons Dae Gil to deal with Yi In Jwa. 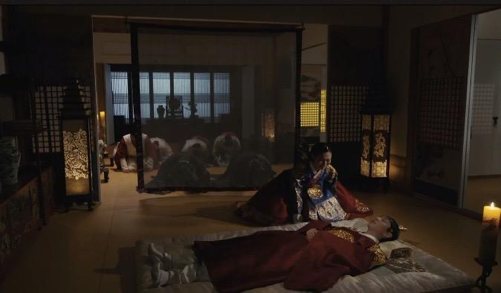 When he arrives, Yeongjo sits on the throne with his young son, Crown Prince Hyojang, whom Dae Gil says looks like his father after the child leaves. The King says his army will be ready in ten days, but Dae Gil pleads for the safety of the people. So the King gives Dae Gil five days to stop Yi In Jwa before he sends in the army. In the meantime, the Soron faction discuss current events when the Shaman delivers a letter to them from Yi In Jwa. They agree to side with In Jwa as long as everything in the letter is true. Otherwise, they will oppose him. The letter states that Mil Poong Goon, the great-grandson of Crown Prince Sohyeon, will be installed as the new King. In a conversation with Yi In Jwa, Mil Poong Goon points out that they need someone inside the Palace, and Yi In Jwa reveals the support of the Queen Dowager. She cannot forget the night the King was poisoned. Her blood curdles at the sight of King Yeongjo. The minute Mil Poong Goon agrees, she will raise her sword. Mil Poong Goon risks all and consents to the wishes of the ever deceitful Lee In Jwa. Dae Gil goes to see Hong Mae and asks her to procure medicine. “You made your living on the blood and tears of people,” he says, “for once do something on their behalf.” Hong Mae complains but agrees. 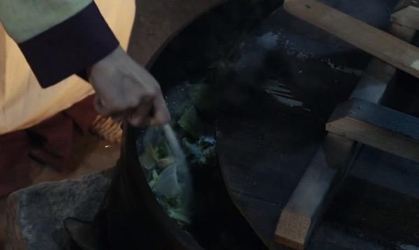 Dae Gil gives the medicine bag to Seol Im, and when Yeon Hwa confirms that she has 30 horses and fodder, Dae Gil reveals he will go to Mokcheon city even though it is not strategically important. The goal is to catch In Jwa in three days. 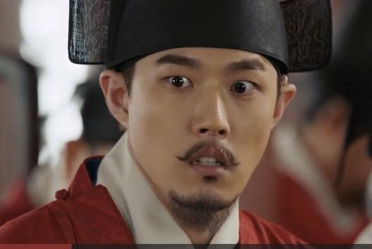 Kim Chae Gun has warned Baek Dae Gil that the King will not sit around and wait for five days. Dae Gil’s strategic plan begins! The infiltration of his people into the rebels will commence. Meanwhile, Yeongjo begins his preparations. The citizens of Mokcheon swear allegiance to Yi In Jwa and bow down before Mil Poong Goon. “The will of the people is the will of the gods,”Yi In Jwa states. Man Geum and his people enter Jeonju Fortress while Hong Mae busily plants seeds of doubt about Yi In Jwa in Hanyang. Yeon Hwa sends a carrier pigeon to Baek Dae Gil confirming that the bad rumors about Yi In Jwa are spreading quickly. As Yi In Jwa is planning his entry into the city, he is told about the sick men and that the storehouse is on fire. As he watches the fire, he finds out the horses are all gone. “There’s a rat hiding in our midst,” he says. A horseman gallops in and confronts Yi In Jwa! Simultaneously, King Yeongjo orders his soldiers to “slaughter them all.” “The Tigers” are burning brightly. Daebak, my thoughts and impressions. A resounding round of applause to the production team and entire cast of Daebak for an incredible job with great care and attention to detail. We are allowed a glimpse into the phenomenal Joseon Dynasty. The teamwork of producer, director, writer, graphic design team, lighting, sound and music, set and costume designers is masterful. The assembly of seasoned actors have the ability to seamlessly interact with each other, creating the precise chemistry needed to bring this entire production to life both artistically and visually. The courage of actor Jang Keun Suk to undertake this challenging and difficult role speaks volumes about his dedication to his craft and talent. Dae Gil captivates and wins our hearts with his determination and strength. The work of Jeon Kwang Ryeol (Yi In Jwa) is always masterful. And then there is the charismatic Choi Min Soo who made King Sukjong live again. 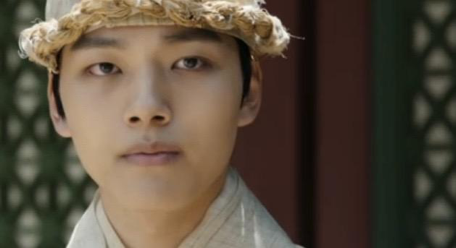 Yeo Jin Goo may be the youngest, but his years of acting serve him well as King Yeongjo. Thank you SBS for giving us Daebak. A good drama makes us forget the reality of our everyday existence and live in another moment in time. Daebak has succeeded brilliantly! What the hand dare seize the fire?" Two tigers of King Sukjong is ready, showing their claws, and strength.. Thank you for your beautifully composed summary. Your use of Blake's poem to describe the divergent paths of the brothers is so unexpected and so satisfyingly insightful. With just those few words you've given us the heart of the entire drama. Also, thanks for so eloquently voicing what all of us feel about the beauty of the production, depth of commitment by cast and crew, and complete believability of the acting. For me these characters have their own existence - their own dreams, hopes, fears - separate from the actors who created them. I can't ask anything more than that from a drama.